OTTAWA — The Ottawa Senators’ special teams did a number on the Pittsburgh Penguins, who saw another key player felled by injury. Craig Anderson made 27 saves for his second shutout, Erik Karlsson had a goal and two assists, and Ottawa ended Pittsburgh’s seven-game winning streak with a 5-0 victory Monday. Zack Smith, Bobby Ryan, Kyle Turris and Cory Conacher scored for the Senators, who ended a three-game skid (0-2-1). Ottawa led 2-0 in the second period and put the game out of reach with three goals in the third, including Karlsson’s 10th of the season at 1:36. 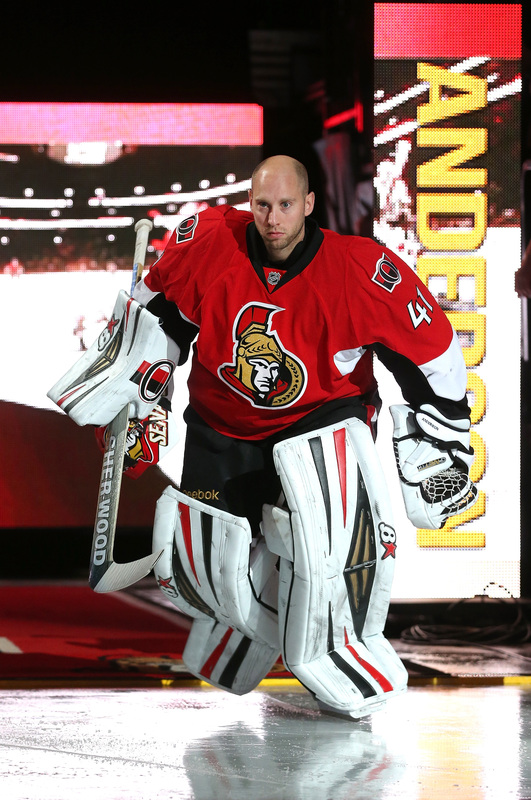 Anderson recorded his 24th career shutout, the Senators’ first since he stopped 35 shots in a season-opening 1-0 win against the Buffalo Sabres on Oct. 4. Pittsburgh went 0-for-7 on the power play, including a 5-on-3 opportunity for 1:12 with 3:31 remaining in the third period. Ottawa went 1-for-3 with the man advantage. Pittsburgh captain and NHL scoring leader Sidney Crosby’s point streak ended at 10 games. Crosby, who has 54 points and was named the League’s Second Star of the Week on Monday, had seven goals and 10 assists during it. It was the eighth time Crosby has been held without a point in 39 games. The Penguins were shut out for the second time this season; Pittsburgh lost 1-0 to the Colorado Avalanche on Oct. 21. Marc-Andre Fleury, who played his 499th regular season game, made 24 saves in his 479th start. “I think we knew we weren’t going to win every game until the end, but every time you lose it’s frustrating, especially when it’s 5-0,” Fleury said. Pittsburgh, which had won 12 of its previous 13 games despite several injuries, lost forward Pascal Dupuis to a lower-body injury on his second shift of the game. Dupuis collided with Crosby, whose right skate flew perilously close to his linemate’s head after he was upended by an open-ice hip check by Ottawa defenseman Marc Methot. Dupuis favored his right leg as he was helped off the ice by linemate Chris Kunitz and defenseman Matt Niskanen. The Penguins right wing did not return, and Pittsburgh coach Dan Bylsma had no update on his condition after the game. The Penguins were already missing forwards Evgeni Malkin, Beau Bennett, Andrew Ebbett, Tanner Glass and Jayson Megna, defensemen Kris Letang, Paul Martin, Brooks Orpik and Rob Scuderi, and goalie Tomas Vokoun, all of whom are injured, and defenseman Deryk Engelland, who served the last of a five-game suspension. Crosby left the game briefly moments after Dupuis went to the dressing room but he returned within minutes. He was upset about Methot’s hit. Told about Crosby’s comments, Methot defended the check as a clean hit. Karlsson, who assisted on Ryan’s team-leading 17th goal in the second period, made it 3-0 lead with a highlight-reel goal at 1:36 of the third. The Senators defenseman broke down the right side to take a pass from Clarke MacArthur. He cut inside on Penguins defenseman Olli Maatta as he approached the blue line and snapped a shot from the right faceoff dot over Fleury’s left arm into the top right corner. Karlsson got his third point with an assist on Turris’ ninth goal, which made it 4-0 at 12:42. Conacher, who drew into the lineup after forward Mika Zibanejad was a last-minute scratch because of the flu, scored Ottawa’s fifth goal at 14:02. The Penguins were down to 10 skaters on their bench at one point when Crosby and Niskanen went to the dressing room briefly in the first period after Dupuis left the game. Referee Dean Morton also left the game momentarily after he was hit by the puck squarely on the back on a hard dump-in by Ottawa’s Cody Ceci. Smith scored for a second straight game to give the Senators a 1-0 lead at 6:54 of the first. After winning a draw against Pittsburgh’s Jussi Jokinen in the right faceoff circle of the Penguins’ zone, Smith drove to the net as the puck went back to Ceci. Fleury stopped the 20-year-old defenseman’s shot from the right point, but Smith got the rebound and put a backhand shot inside the right post for his seventh goal. Ryan scored on a power play at 5:46 of the second period to put Ottawa up 2-0. He deflected Chris Phillips‘ slap shot from the left point past Fleury for his team-leading 17th goal. Anderson stopped James Neal on a breakaway just past the 12-minute mark of the second.